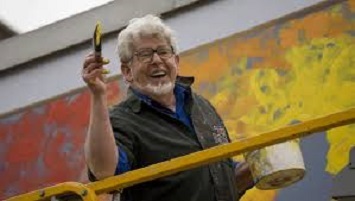 Rolf Harris has today begun his defence against charges of indecent assault by way of puffing, panting and playing the wobble board whilst simultaneously painting a 24 foot high mural, an action that he says will prove him innocent of all charges. One juror told us of his surprise that instead of cross examining the witness, Mr Harris’s defence counsel merely brought in a large screen and a number of pots of paint. In a recent similar trial former radio one disc jockey Dave Lee Travis gained an aquittal by telling the jury what time it was, what the weather was like and how busy the traffic was, before playing the latest Status Quo single.